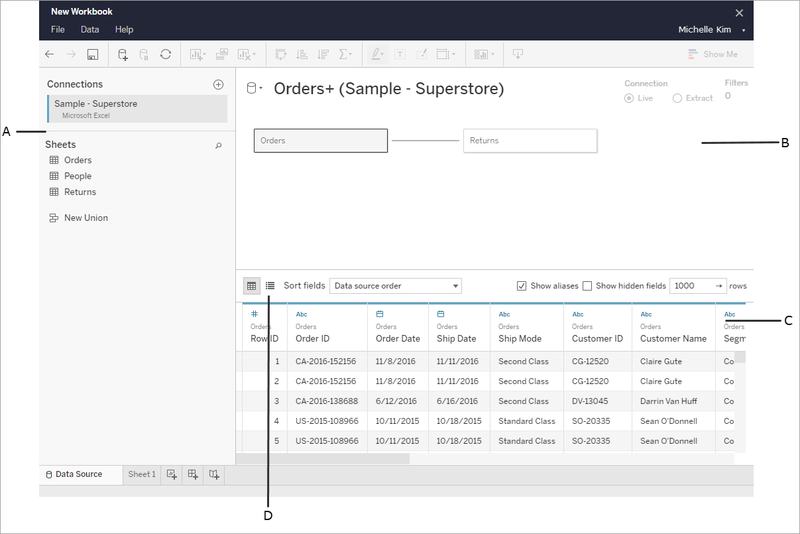 Once you've connect to data in Tableau Online or Tableau Server, you can use the Data Source page to set up your data source and prepare your data for analysis. Having data that is formatted in a way Tableau likes is crucial to building a view or doing analysis in Tableau, and communicating the right information to the right people. This article describes preparing your data in the browser with Tableau Online or Tableau Server. Although Tableau supports many of the same functionality for preparing your data for analysis in the browser as Tableau Desktop, for specific differences between the two, see Web Authoring and Tableau Desktop Feature Comparison. Displays details about your data connection. For example, for Excel-based data, the left pane shows your Excel workbook name, and sheets contained in that workbook. For databases, the left pane displays the server, the database or schema, and tables in the database. When connected to most relational and file-based data, you can drag one or more tables to the canvas area to join tables for analysis. You can use the data grid to review or rename fields, create calculations, preview your changes, and more. Select the metadata grid button to see the fields in your data source as rows. This view is helpful in understanding the structure of your data source. You can make changes to your fields in the data grid. You can rename your fields, group them, create aliases, create calculated fields, change data type, and convert to a measure.